Why You Really Need A Coach. The following article has appeared on the website run247.com and is reproduced by kind permission of the Editor. A common misconception people have regarding running coaches is that they are reserved for elite or professional athletes, or those serious runners who only want to be competitive. That really isn’t the case. Sometimes, you get injured. Sometimes, you lose focus and motivation. Sometimes, you want to improve but you run out of ideas about precisely how to get there. And searching the internet just leaves you confused by reams of differing and, quite often, conflicting information from people that don’t know a lot more than you. Just as a personal trainer helps you learn how to lift weights, or develop a better strength training workout, a running coach is your personal running trainer and will teach you how to run faster for longer! Thanks to improvements in technology, there has been a growth in recent years in the number of online running coaches. All claim to have a wide breadth of knowledge to share, and all promise to keep their athletes happy and motivated through regular communication. So how do you determine which coach is the one for you? And what are the benefits of working with a personal coach as opposed to self-coaching? I recently talked with coach Martin Cox, the athlete behind VO2maxcoaching. I picked his brain about his training philosophy and how an average runner like myself could benefit from a running coach. Below are Martin’s answers to my (many) questions about why I think you should use a running coach. Were you ever coached yourself? “I’ve had a coach even since I started running for Leicester Coritanians Athletics Club at age 16. And since then, wherever I’ve happened to have been living, I’ve always found myself a coach instead of trying to do everything on my own. On my first trip to Italy in 1996 I sought advice from Renato Canova; in New Zealand in 1999 it was Arthur Lydiard who helped me out. A couple of years ago I decided to switch to ultra-running, but didn’t bother with a coach. Instead, I adopted a go with the flow attitude, changed my brand of footwear to a fashionable, low profile type of shoe, and made a number of bad training decisions that eventually led to injury and an 8-month enforced lay-off”. 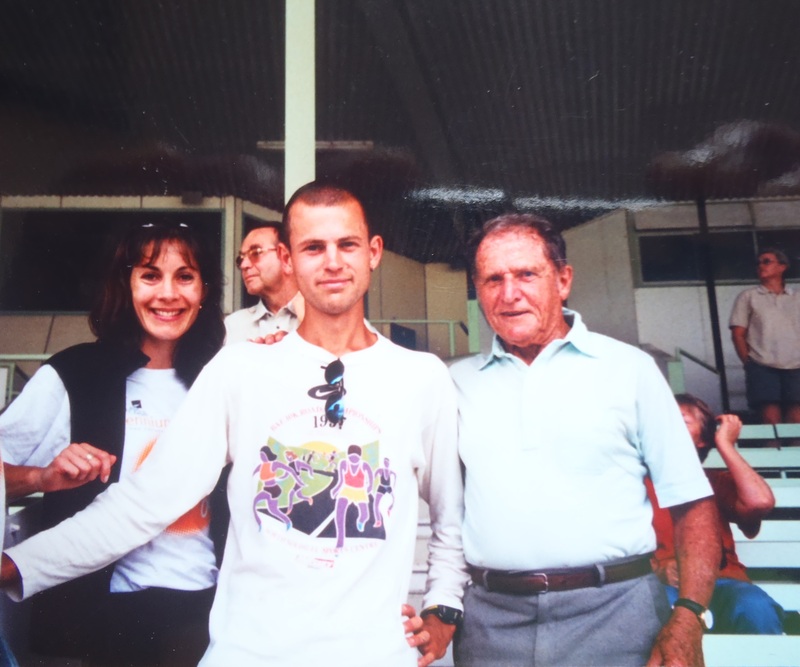 Martin with Arthur Lydiard, Hamilton, New Zealand,1999. In a nutshell, why is having a coach so important? “Every runner I know has goals, from finishing a 100 miler or qualifying for a Great Britain team, to running a new 10k PB or just getting into better shape. A coach can guide you towards these goals. A coach will stop you making stupid mistakes and keep you accountable and answerable. And a coach will look at what you’ve done in the past and what you’re doing right now and help you adapt as needed and provide you with new ideas as to how you can take your training to the next level”. What do you mean by ‘accountable’? “Runners rarely see themselves as people who cut corners, but when they have a coach to report back to they may suddenly find themselves not cutting corners that they have cut unconsciously before! Without the motivating force of a coach watching over their shoulders, most runners would probably admit that they would have rather stayed in bed when the weather was bad, or replaced a tough interval session with an easy run, but knew that they would feel guilty for not doing the training and would feel like they were letting the coach down”. And what do you have in mind when you say ‘adapt as needed’? “A coach is objective and able to see things that the runner may not notice themselves. A runner may continue to make the same mistakes out of habit until the coach points out where they are going wrong. With a good feedback system between runner and coach, the coach is able to recognise patterns in an runner’s response to various training stimuli, allowing adaptations to be made to their training schedule. Running doesn’t occur in a vacuum. Not every session or race will go precisely as planned. Work, family, illness, the weather, social life – these can also be factors that force you to adapt a runner’s schedule”. “Simply put, the coach takes all of the guess-work out of training – takes the burden of planning and interpreting training off the runner’s shoulders. A coach will figure out where, when, and why you’re running a particular distance at a particular pace. A coach will determine when exactly to do your 20-mile runs in your marathon schedule, or when to introduce hill reps into your cross-country training”. 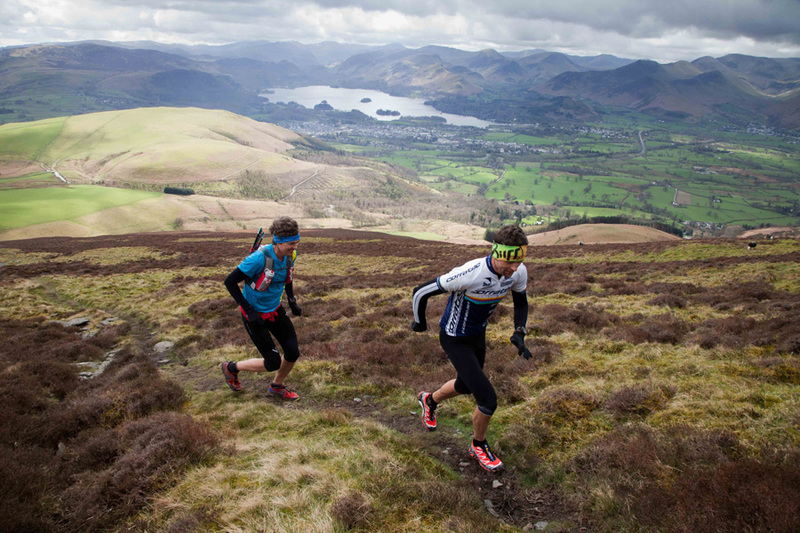 Martin Training with Scott Jurek in 2013 for the Bob Graham Round (photo by Rickey Gates). “Individualised, planned and progressive training is the key! I look first to the runner’s needs, and at the their strength and weakness. Each training plan needs to be tailored to the individual’s strengths, while addressing some of the more pertinent weaknesses. Some runners thrive off a lot of mileage in their training, while others benefit more from speed sessions. With any runner I look at the background that they are coming from. Ultimately, all runners will benefit most from consistency in training and the avoidance of repetition”. What do you mean by avoiding repetition? “More often than not, when self-coached athletes start training hard for the first time, they will meet with early gains in performance. However, after a while they run out of ideas on how to improve. Lack of knowledge leads many runners to make fundamental mistakes in their training, such as not varying the intensity of their workouts sufficiently or becoming fixated with running a set number of miles each week”. “In my experience most runners who are training on their own, or with friends, over-emphasize volume and under-emphasize intensity. In a relatively short time they will peak, plateau, and experience a sharp decline in form. This happens because the body is an remarkably adaptive machine. By doing the same workouts on the same day every week, over and over again, the body will eventually cease to adapt. Once the body has become accustomed to a certain training stimulus the fitness gain has been made. After that, if you just keep providing the same stimulus, it has no reason to make any further fitness gains”. “Part of the process of getting fitter is to train your body in a way that causes positive adaptation. A good coach will ensure this is exactly how your training is structured, and it’s as important for recreational runners as it is for elite athletes. Through the strategy of periodisation, a coach will be able to devise a training plan for the season that has the runner peaking for the highest priority races. With periodisation there is always recovery phase, followed by a re-building and preparation phase, followed by more specific training intended to bring the runner to an event in peak condition. The time periods vary hugely between runners, but this in general is what coaches mean when they talk about periodisation”. So is this how you help your athletes get faster? “It’s a combination of many things, but increasing speed has two main components – your running form and aerobic development. With improved running form you are more mechanically efficient and able to get from point A to point B using less energy. The way to improve form is with very fast running and all of the runners I coach have some form of pure sprinting in their training plans”. “Aerobic development calls for interval training and endurance running at various intensities, from long slow jogging to what you might want to call ‘high-end’ aerobic running – for example, threshold/tempo running, marathon pace runs, and progression runs. These days the wide use of sports science and technology means that a lot of the guess work about training intensity can be taken away. However, there’s a time and a place for speed-work and mileage. As I mentioned previously, periodisation is crucial, particularly the rest and recovery component”. Just how important is recovery? “It’s normal for many self-coached runners to train really hard all the time without making any performance gains. In fact this method of training often leads to over-training and a drop in form. While I think that this random, do-whatever-you-want-as-long-as-you-go-hard type of training is useful to build the tolerance needed to progress to more frequent and specific training, many runners don’t realise that in order to get faster they don’t need to run hard and run fast all the time”. “The body actually makes most of its fitness adaptations and gains during the recovery time. A good coach will give their runners recovery periods periodically (for example, one week in four will be an ‘easy’ week; one day in eight will be a rest day). And they wil offer a good balance of intensity, volume and recovery each week. I usually employ the hard/easy concept during periods of specific training; that is, three days of interval training interspersed with easy running”. “Also, individual athletes will have varying levels of what they can cope with before they become sick, injured or over-trained, and this will depend on their age, training history, and lifestyle. This is where the coaches’ experience comes in and it’s one of the biggest reasons why I think every runner needs a good coach”. Scottish athlete, Robbie Simpson, who is coached by Martin. What was the biggest benefit to yourself from having a coach? “The ability to see the bigger picture, hold the reigns, and predict an athlete’s future actions is one of the most important reasons why I strongly believe in having a coach. For me, it wasn’t so much for the training – to motivate me and challenge me with varied and interesting workouts – though that was of course very important. For me, my coaches main role was to provide that unbiased and objective observation. I’m sure almost every runner I know could develop some sort of a training plan that would get them pretty fit, but what the self-coached athlete really misses out on is that person who is able to work outside of their conscious narrative, stop them being blind to the obvious, and prevent them from making silly mistakes”. “We can’t see ourselves from the outside, from the perspective of other people, because we are biased by our own conscious feelings and thoughts. What happens with us runners is that we construct a narrative – a story – that we are very tough and able to battle through anything that comes our way. Outwardly, we express a desire to keep pushing and perhaps tell everyone that we feel great, to justify that story in our head. For example, you’ve a sore spot on the achilles tendon and you convince yourself that it’s just a niggle and that you will be able to tough it out tomorrow on that crucial long tempo run. It’s the same with feeling lethargic and running slow times in training. We often respond to the obvious symptoms of overtraining by training harder”. “Getting regular and accurate feedback from the runner is one of the coaches most important jobs, it’s the best way to access the information in the runner’s conscious narrative. The key is getting the communication right so that the runner and the coach are on the same page. I’ll ask questions concerning their behaviour – about how the runner feels, how they are sleeping, general energy levels, how’s their appetite been, and so on – I’ll pay close attention to their answers and the tone of their voice. I’ll have them fill out detailed training logs. All this to get inside their mind and see the world through their lens. This information can then be used predict future behaviours and allow me to adapt their training and prevent them from making mistakes”. Finally, what do you think makes you a good coach? “Coaching is both an art and a science. I’ve been personally immersed in the sport of distance running for over 30 years. I’ve studied Sports and Exercise Physiology to degree level, and I’ve trained under some great coaches and with some awesome runners. I’ve also raced at a pretty high level. In that time I have developed a number of the key traits that I think are mandatory in any running coach”. “Because I used to be a professional runner, this helps me really understand training on a deeper level – how to set realistic goals, the day-to-day fatigue of marathon training, what it actually feels like to win and lose – and this allows me to empathize with athletes. When I give someone a session to complete, not only will I understand the physiological benefits of the training, I will also have completed it myself and know just how the runner feels when doing it. I think a lot of runners want a coach who is (or at least was!) faster than they are so the coach knows how to push them to a new level. Moreover, I’ve been a fairly successful mountain runner and have also ran ultra-marathons, and I believe it’s difficult to coach a runner on the nuances and subtleties of running continuously uphill for long periods of time or covering such huge distances unless you’ve done it yourself”. “I also have experience of being coached. I’ve picked up many of the most effective coaching techniques, such as the right way to motivate athletes and the benefits of not over-coaching. I’ve been exposed to many different coaching styles, from old-school and aggressive, to more nurturing. Seeing those coaching styles in action, learning from them, and now applying them in my own coaching career is what helps me provide coaching that gets runners the results they are after. I’ve learned that the best coaches know instinctively how to build confidence in their athletes. They quickly learn the right buttons to push and find ways to inspire them to train consistently and provide motivation and support when their minds start to work against them. Not every athlete responds well to the same style of coaching. Some need pushing, a few will require a bit of mothering from time to time, and others are more analytical and will simply want to know the facts”.